Welcome to 7 Days to Launching your Event Planning Business. This is NOT your typical business launch program (and not just because it is 100% FREE for you!). I remove all the fluff and confusion out of the business launch process and outline the simple steps you need to take to get your business up and running in the next 7 days. 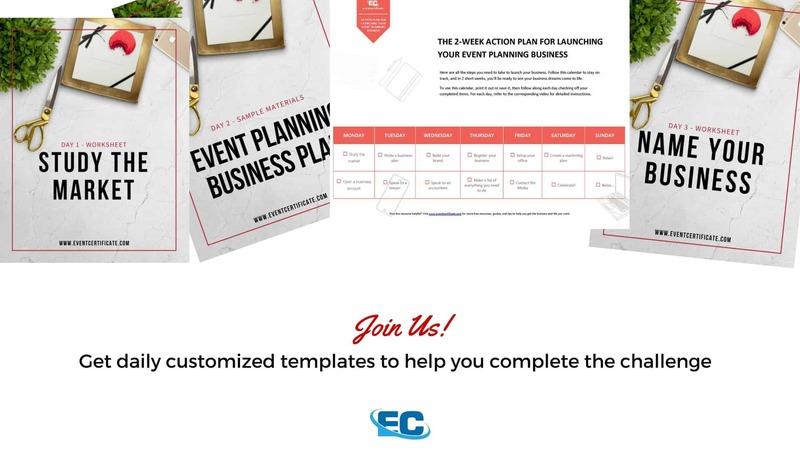 In this email & video series you will get step-by-step instructions emailed to you daily, to help move your event planning business from dream to reality. DAY 1: Is your business idea viable? I took some extra time to complete the course but was grateful to have the steps outlined so simply. I cannot believe I waited this long to start my business, this was the kick I needed! Jody-Ann was very knowledgeable and helpful throughout the course, responding to all my many many questions. Thank you for making this a free resource! The course was very helpful, I can even now create my own logo without spending any money. I'll definitely use the business programs as well to help me start my business. Complete step by step, very thorough and lots of extra resources and links. Nice Presentation. Quite enjoyable. A private Facebook Group - where you will be surrounded by other supportive Eventpreneurs who share your obstacles and will help you along the way. Tools, Templates and Resources - To help you get your business off to the right start. Your own Schedule - you'll be provided with simple action items to complete each day at your own pace. RESULTS - At the end of the 7 days, if you implement each of the bite-sized business-building tasks, I can practically guarantee you’ll be well on your way to reaching your goals.